Saving money on food is my passion (which is one reason why I started this blog in the first place!). I used to be an avid couponer, but I had to quit couponing when the thrill of the hunt became more important than just saving money. Because of this, I’ve been hesitant to use a grocery shopping app to save money. 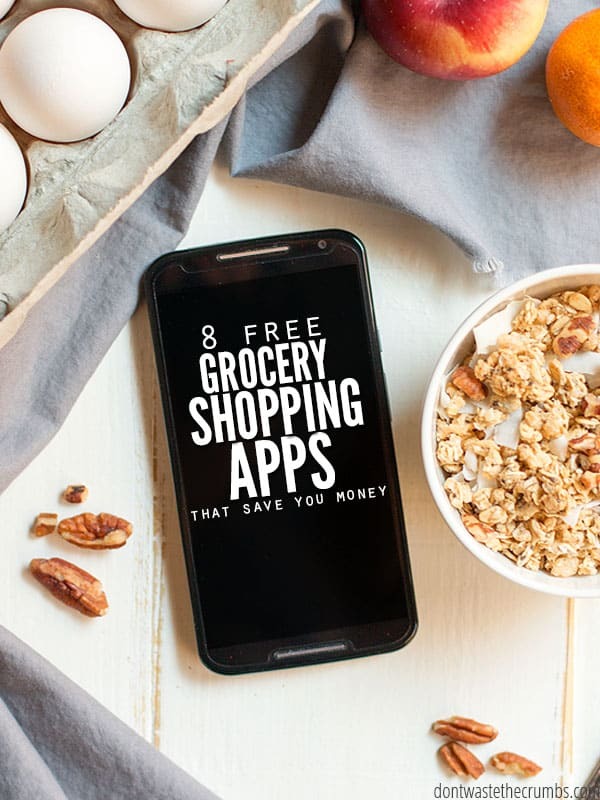 But earlier this year, I cautiously dipped my toe into that realm and found that using apps for groceries is an easy way to save AND you can do it without spending a lot of time or effort! A couple of years ago my husband and I switched from iPhones (me) and old-school flip phones (him) to smartphones through Republic Wireless (which only costs us $10 a month). It took me awhile to understand how a grocery shopping app could be helpful in terms of saving money – especially on real food – but once I downloaded a few and started using them in my weekly shopping routine, it became a no-brainer! While building Grocery Budget Bootcamp, I tried out several grocery shopping apps to see which ones were the best. Below are the best grocery shopping apps I’ve tested and they’re all FREE! I’ve shared my personal favorite grocery shopping app, plus a few others. I’ve included grocery rebate apps too, so you can save before AND after you shop. Favado offers side-by-side comparison between weekly grocery circulars and it’s my favorite grocery shopping app in terms of looking at sales. You can compare two stores or compare all the stores you choose. The app will then organize the circulars into categories, making it easy to price compare between them all. For example, you can see all the meat from all the stores at one time, letting you meal plan based on the best deals. You can create a shopping list within the app, add your store loyalty cards and even personalize the app so you can easily see when your favorite brands and items are on sale. Favado also tells you when there’s a corresponding coupon available in the paper, although you are responsible for clipping the coupon and taking it to the store (if you choose to clip coupons). Favado pulls the weekly circulars from variety of stores, including main stream stores (Kroger), discount stores (ALDI), big box stores (Walmart) and bulk warehouse stores (Costco). Flipp is like a repository of weekly circulars. There are grocery stores, but also sporting stores, craft stores, department stores and even drugstores. Flipp also tells you what coupons are available and where they’re valid. When you upload your store loyalty cards, you can automatically add the coupon to your store. Flipp added a shopping list function that allows you to add items to your shopping list and the app will tell you where it’s on sale and for how much. It includes related items too, because when I added “eggs” to my shopping list, the app also pulled up an egg cooker from Macy’s, eggnog from Food Depot and L’eggs pantyhose from Walgreens. There is a web-based version for Flipp, which you might find easier and more helpful when you’re searching the circulars. Once you find your savings, it will sync to your smartphone app and you can take it with you to the store. Grocery Pal isn’t quite as robust as some other apps, but it’s still a good one. It syncs up with weekly circulars and categorizes the items so you can check the sales at your local stores with what’s on your shopping list. There are coupons within the app as well which you can add to your shopping list. You can even create shopping lists and save them for later, so you’re not re-writing lists each week. My favorite function within Grocery Pal is the search function, which allows you to search for “cheese” within the circulars so you can see at a glance whether or not your store has a sale for what you need. Checkout 51 is a cash back app that pays you money for buying your favorite groceries at your local store. Once you download the app and open an account, you simply select your rebates, scan the items barcode, and take a picture of your receipt. It’s pretty easy to use, but I’ve found that it’s limited to a few products each week and they tend to be processed foods. I’ve redeemed a rebate for milk, but that’s about the extent for real food. One drawback to Checkout 51 is that the rebates are limited to first-come first-serve. If you don’t add the rebate to your account for redemption early enough, you will miss out. The threshold for Checkout 51 is $20, which you can redeem for cash. Ibotta is one of the most popular rebate apps available and it’s my favorite grocery shopping app. You can receive rebates for brand name and non-brand items and there are at least a couple of offers each week for real food like bananas, onions, tomatoes and potatoes. Ibotta is store-specific, meaning you have to shop at a store that is synced with Ibotta and you can only redeem the rebates offered at those stores. Many rebates are available at several stores, like a certain brand of cereal or butter, but there are some that are ONLY available at a particular store. Most mainstream grocery stores like Kroger, Albertsons and Food Lion can sync with Ibotta, but there are also non-grocery rebates available at places like Best Buy and Michaels, online stores like Jet.com, big box stores like Walmart and Target and even some restaurants. Unfortunately Ibotta does not work at smaller discount stores like ALDI and Grocery Outlet. In addition to the rebates for individual items, Ibotta has bonus rebates when you redeem a certain number or type of rebates within a month, like 4 rebates from Kellogg or 6 rebates total. You can cash out or redeem for gift cards once you reach $20 in rebates. SavingStar is part rebate and part coupon app. If your store has a loyalty program, you sync up your card with the app and load the offer before you shop. If your store does not have a loyalty program, you choose the offer before or after you shop and load your receipt after you’re done shopping. There are a lot of offers for non-real foods, but there also some for pantry items like tea and cheese, and some toiletry and household offers too. Every few weeks there’s a coupon for 20% off produce too. Some of the rebate offers require you to by a specific quantity to get the rebates, like save $4 when you spend $16, and other rebates are for individual items. When you choose an offer, it’s added to a list so you can see all your rebates at a glance. The threshold for cashing out of SavingStar is super low – just $5. The Shopmium app offers rebates on popular brand name items, including food and toiletries and household items, at your local stores. Some rebates are up to 100% giving you free groceries. The downside to Shopmium is that there are not a lot of offers available as a whole. However, the rebates are high on the offers that are available. Psst! Want free chocolate? Sign up for Shopmium and enter the code AEEYUEUJ and you’ll get a FREE Lindt chocolate bar! The Savings Catcher app is within the Walmart app and it compares prices to the other weekly circulars in your area. When you’re done shopping, you upload your receipt and the app will automatically price match against your local stores and give you an e-gift card for the difference. The goal is for you to get the lowest price in your area without shopping around. Savings Catcher works best when you buy brand name products instead of store-brand, so it’s not ideal if you buy store-brand but it can be great for products you are brand loyal to. Because of the brand issue, it’s not the best option for produce. I once bought a pineapple knowing it was 50 cents cheaper at Kroger and Savings Catcher did not recognize the savings. There are many more apps that offer more advanced features although some cost money. You’ll have to evaluate if that’s something you want to invest it. (Grocery King is one of them.) However, you can use one or many of the apps listed above and easily save money. If I had to pick just two apps, Favado and Ibotta are my favorites. I use these for groceries and programs like Swagbucks and Ebates for non-grocery items online and between them all, I save the money earned for Christmas gifts or splurging on special treats so I can keep putting cash in my savings account! What grocery shopping app do you use to save money? I used Nutrisavings which is sponsored by my work and our Harvard Pilgrim Insurance. The nice thing about this program is it has healthy foods since that’s the whole point. An example is loose mushrooms 20% off up to $2.00, Loose pears 25% off up to $2.50, $1.00 off Food Should Taste Good chips, etc. Each month there are new deals you can activate then you shop at your local store and scan your rewards card if you bought all of the food they offer at a discount it’s like $40-50/mo of savings. I generally earn like $15 since not everything interest me, If you shop at Walmart they send you a special card rewards card to scan otherwise you just use your stores rewards card.The savings you earn go in an account that you can cash out once it hits $10 or more. I haven’t heard of this one before Ally – thank you for sharing!! Hello, Thanks for sharing such a great grocery app….Best blog. very helpful article. Online grocery business in India is rapidly growing.I like your article because now a days everyone looks for latest technologies and easy done. My favorite app is Out of Milk, and though they have versions on both iOS and android, the latter app is far superior. The devs tell me that their iOS programmers have left the company and they haven’t prioritized updating and hiring new employees. However it does work well. The reason I love Out of Milk is because I can rename the categories and arrange them so they follow the flow of my favorite store. When I put an item on my list, I know it will show up in the correct aisle and in the proper order. It also keeps a running total of your trip, including tax. Mine comes right down to the penny almost every trip, except when I buy loose per pound produce. This is a huge budget saver for me. I’d be lost without it, honestly. Oh, and it syncs with other devices across both phone platforms and on PC. Great tips! I would love to spend more time on your blog. I was wondering if there is a way to exit out of the bar at the top wiggling? It makes difficult to read for me with my dislexia. My kids have apps all figured out, but I am just starting! Thank you for sharing your favorites-that gives me a starting place since I know you do a great job spending very little on high quality food. I will pin this for later. I hope it helps Kristie! I run a Budgeting workshop at our credit union and would like to include your article in our hand-out packet as a guide of take-away tools in the member ‘tool-kit’. This is fantastic! thanks for the great info!